That’s because most cultures have a classic meat-and-potatoes dish that makes regular appearances in the home kitchen (hash!). Mexican picadillo fits this bill quite well and is a delicious, easy-to-make dish that does an exemplary job of jarring loose a few of your kitchen table memories. 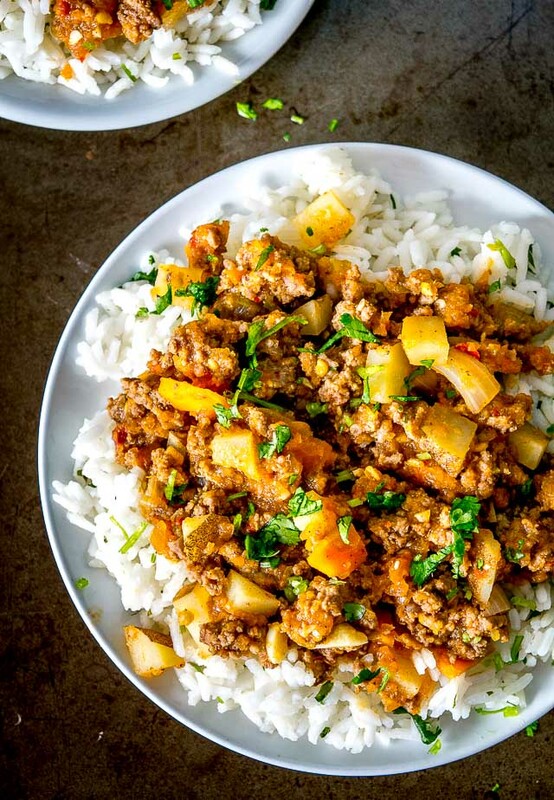 You’ll come across wayward variations of picadillo dependent on which country you’re having dinner in. I’ll list a few tweaks you can make, but I think it’s worth trying out a no-frills version the first time you make it to see how well it gets along with your taste buds. 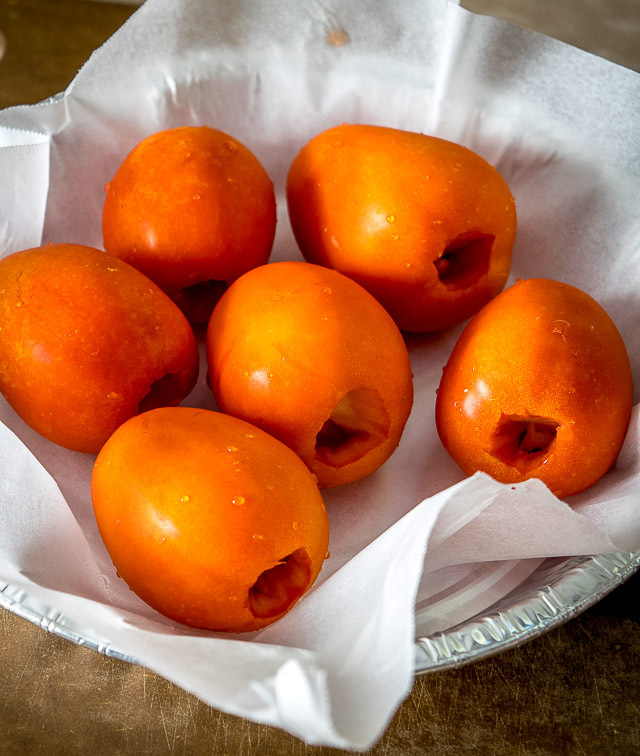 Start by roasting 5-6 plum tomatoes in the oven at 400F. You’ll also need one potato and a medium-sized carrot. Keep in mind that the potatoes will be cooking in the stew; I usually cut them smallish so they’ll need less time to cook. Saute 1/4 onion in some oil for a few minutes. Add 2 cloves of minced garlic, saute briefly, and then add 1 lb. 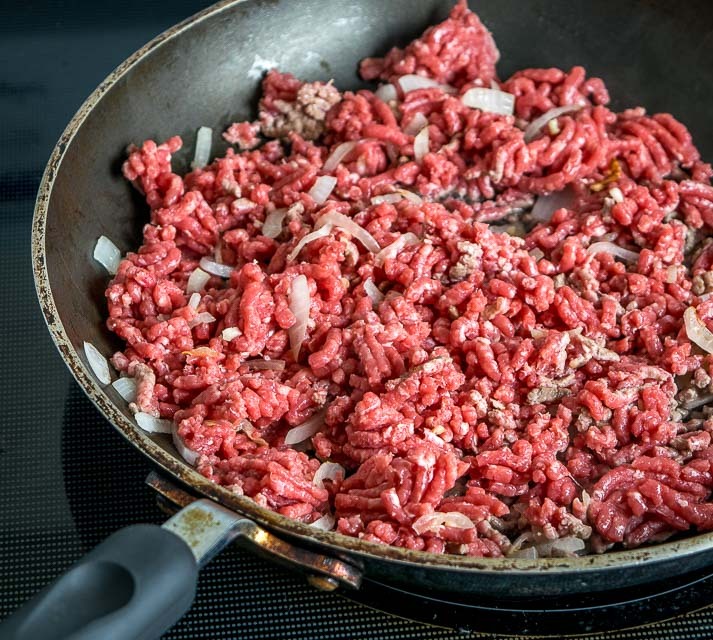 ground beef and 1 teaspoon of salt. 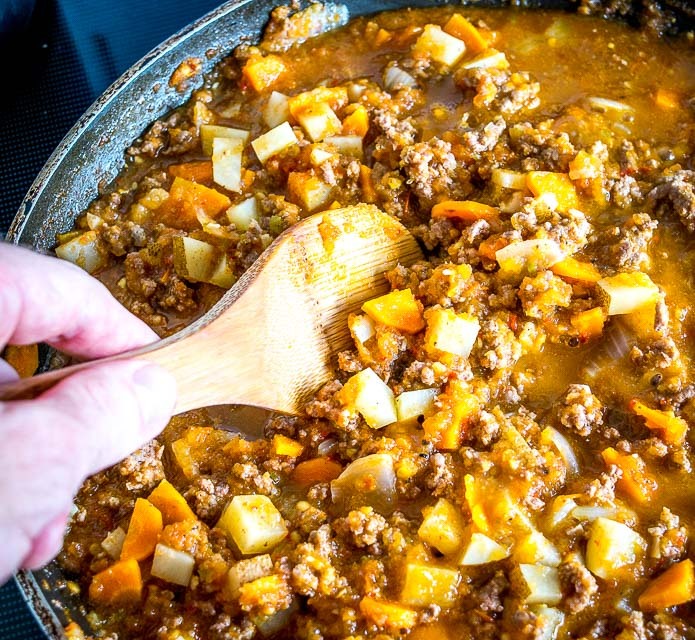 You’ll need a wide, deep skillet to hold all the picadillo. You only need to brown the meat lightly because there’s an extended simmer time coming up. Once you lose most of the pink color add the potatoes and carrots. Saute briefly as you gather the other ingredients. By now the tomatoes are roasted enough. Add them to a blender or food processor, along with 3/4 onion, 1 jalapeno, and 2 garlic cloves. 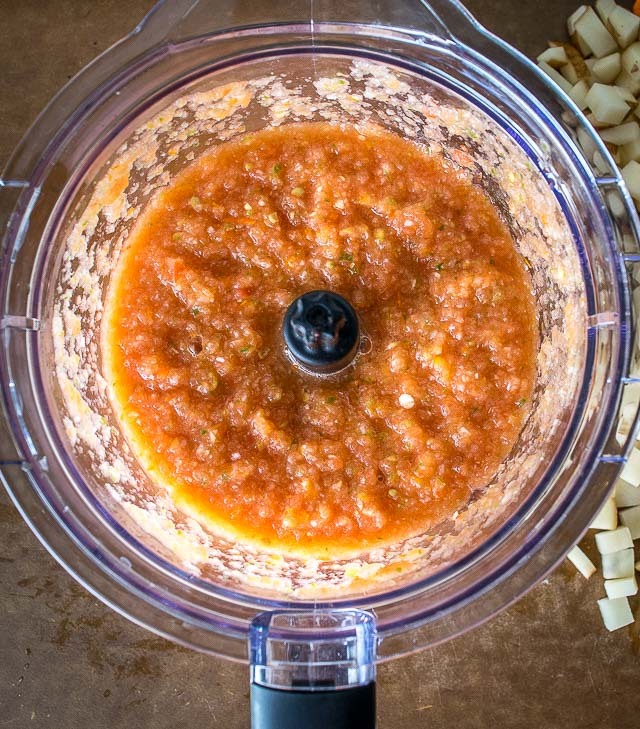 This is essentially a double batch of our Tomato Jalapeno Salsa. Tomatoes and capsaicin (heat) are the base flavors in picadillo and blending them together is an easy way to flavor the meat. Add this tomato-jalapeno mixture to the beef along with 1 teaspoon cumin, freshly cracked black pepper, and one cup of stock (or water). Combine well. 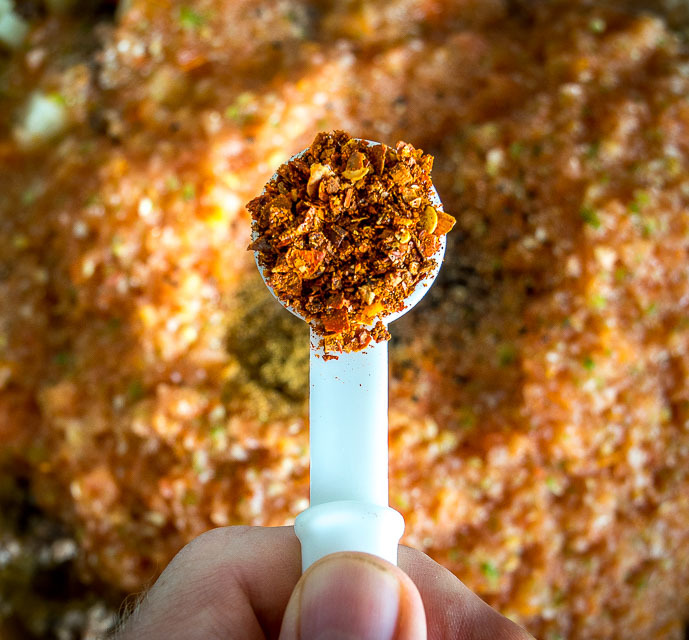 A dose of authentic chili powder is a great way to increase the heat and add another layer of flavor, but you can consider this optional as you’ll already have quite a bit of heat from the jalapeno. Let the picadillo simmer on medium-low heat for 20-25 minutes or until the potatoes are cooked all the way through. By then the sauce will have reduced quite a bit, but ideally you’ve still got some liquid leftover. And now take another taste for seasoning. I added another generous pinch of salt at this point. Yes, Mexican picadillo is a great option for tacos, burritos, and even empanadas, but it’s surprising how satisfying it can be when humbly served over rice. (Especially over this Cilantro Lime Rice). If you’ve got liquid left over in the pan definitely drizzle it over the top of the meat and rice. So good! You’ll also frequently see Mexican picadillo served with raisins. It’s worth experimenting with this at some point, but keep in mind that tastes vary and you’ll probably get a 50/50 approval rating on raisins in your picadillo. You can add the raisins in for the last few minutes of the simmer. You could also make the main batch without raisins and give people the option of adding them after the fact. Olives and capers are also frequently served up in picadillo but I don’t consider them to be essential for this version. You’ll also occasionally see chorizo added to the beef for additional flavor. But sometimes the simplest recipes are the best, so I think it’s worth making this no-frills version to see how much you like it. And if you later find yourself craving some home cooked Mexican picadillo to escape from the hustle and bustle of the world, then you’re on the right track. Update: we just put up a recipe for a Chipotle Cinnamon Picadillo that uses the same process as this Mexican Picadillo. See here. 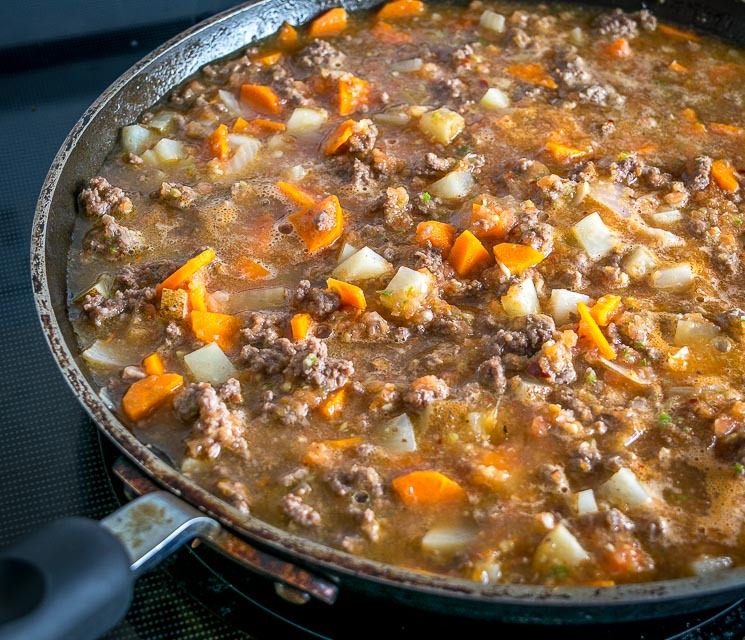 And our latest post uses this Picadillo to make a skillet pot pie. 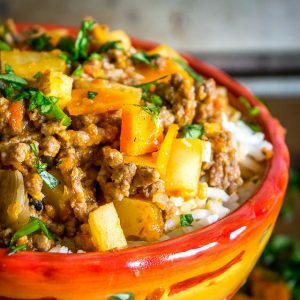 This easy to make Mexican Picadillo is a classic meat and potatoes dish bursting with flavor and spice. It can be eaten straight out of the pan but it also works great in tacos, burritos, and empanadas. So good! After rinsing the tomatoes and cutting out the stems, roast them in a 400F oven for 20-25 minutes or until you need them. 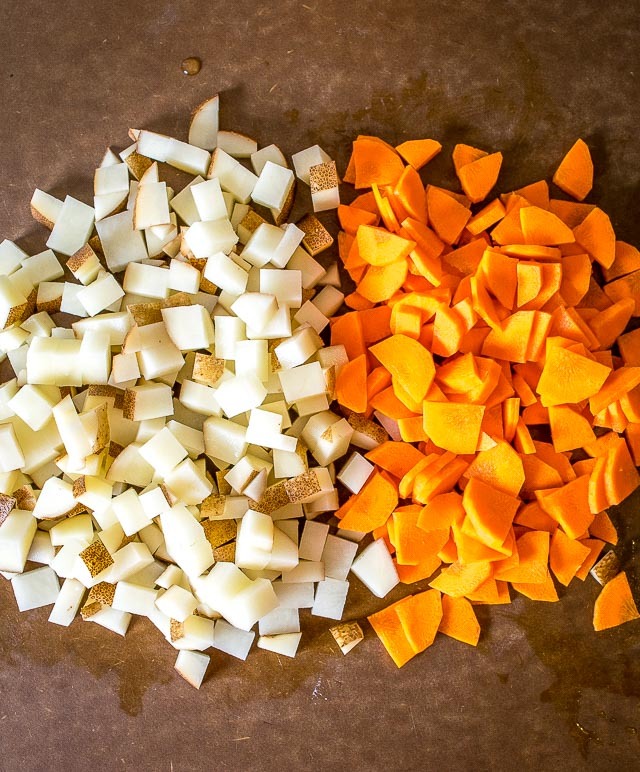 Chop the potato and carrot into smallish pieces (larger pieces will require more simmering time). Once the beef is lightly browned, add the potato and carrot. Saute briefly as you gather the additional ingredients. For the Tomato-Jalapeno mixture, add the roasted tomatoes to a blender or food processor along with 3/4 onion, 2 garlic cloves and 1 jalapeno. Combine well. Add the Tomato-Jalapeno mixture to the beef, along with 1 teaspoon cumin, some freshly cracked black pepper, and 1 cup of stock (or water). I also add 2 teaspoons of chili powder but that is optional. Combine well and simmer over medium-low heat for 20-25 minutes, or until the potatoes are cooked all the way through. Take a final taste for seasoning. I added another generous pinch of salt to this batch. Serve immediately. 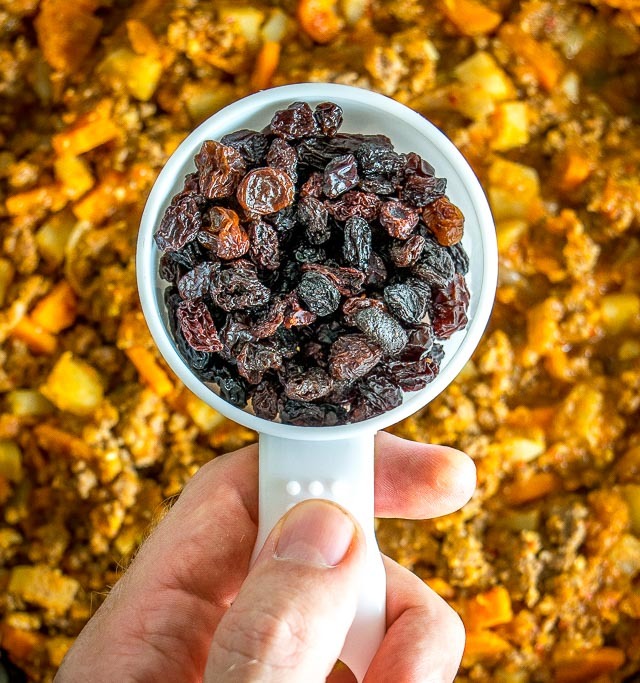 If you want to serve your Picadillo with raisins, you can add them to the beef mixture for the last few minutes of the simmer or you can simply add them as a final garnish. Olives and capers are frequent additions to picadillo if you want to experiment with them. Soup crazy? 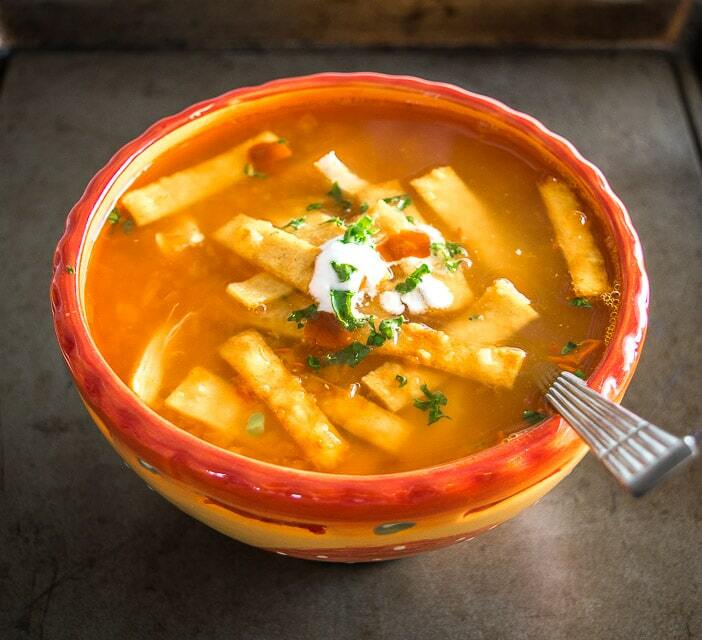 Try our Chicken Tortilla Soup. 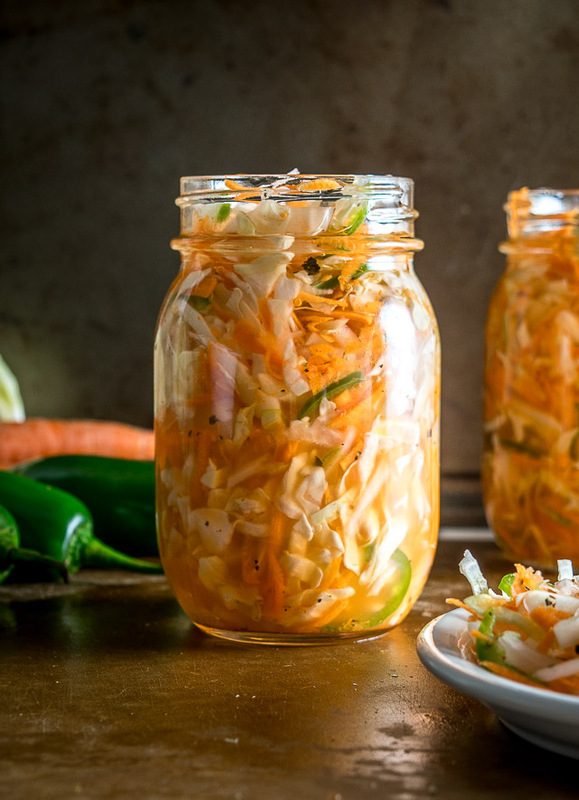 Our latest recipe is Curtido, a spicy pickled cabbage dish. Wow, I can’t believe I’ve never made this before! So good! I served it over rice, which was delicious! I agree that it would be amazing in tacos, burritos, and especially empanadas! I roasted the 3/4 onion with the tomatoes but followed the recipe exactly and it was wonderful! I love raisins but my husband doesn’t so I didn’t add them, but I’ve tasted them and olives in empanadas before and I love it! I can’t wait to make this again, thanks for the wonderful recipe! I can tell just by reading the recipe that this is a near (if not complete) match to my grandma’s lost recipe! Family members recall it, but draw blanks on how to actually make it. Thank you for sharing this recipe! And yes, it is agreed:sometimes the simplest recipes are the best. Put me down for “no” on raisins, though! Raisins go in “ropa vieja”! But hers had more veggies: diced bell peppers, diced celery and she used a frozen carrot/pea blend. The veggies went in towards the last minutes of cooking to retain texture and nutrition. She also fried the potatoes separately like home fries and stirred that in last of all to retain the crispy edges while serving. I would not serve it with potatoes AND rice AND tortillas. My body does not agree with all that hot carb on carb action ha ha. I would make home fries in a separate pan and spoon the picadillo on top. I think that would go well in the morning with a fried egg. I might not use raisins, but I would give drained rinsed capers a try, adjusting the salt of course. Thanks again! Thanks much for your note CactusHeart! I’m so glad you are finding use in the recipe. 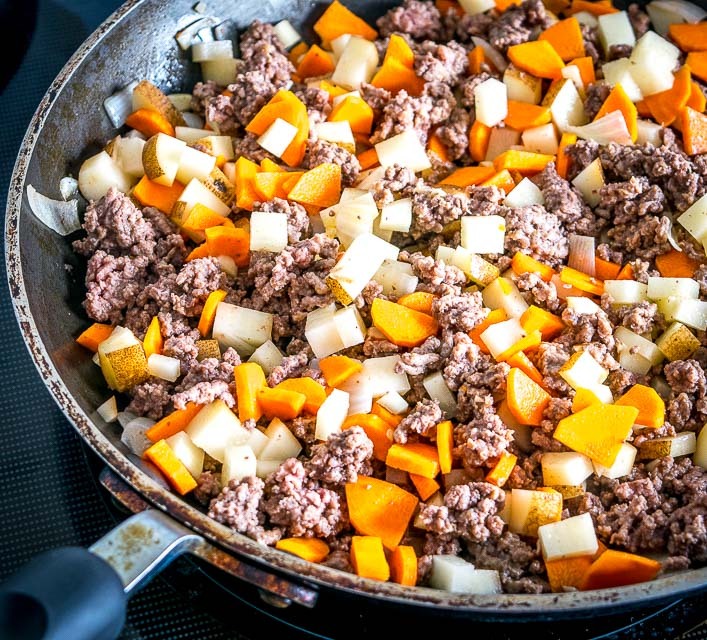 And yowsa your idea of serving this Picadillo over home fries sounds awesome — would love to try that. Cheers. Can I use canned tomatoes, rotel or tomato sauce for some of the tomato mixture? I’m short a few. Thanks! Hi Nina! Sorry for the delay in getting back to you! Yup canned tomatoes are a viable substitute but I would probably still blend them together with the onion/garlic/jalapeno as this flavor combo gives the Picadillo some punch. Rotel would probably be my last choice as I feel like it’s a step down in flavor from a freshly blended tomato-jalapeno mixture. I hope that helps a bit! Please let me know if you have any other questions. Cheers. I really appreciate your tips on the peppers. I have to watch my salt, and didn’t know that they were not pure. Thanks for the feedback Abby, glad you found a keeper Picadillo recipe! Hi Edgar, I usually put the calorie info in the recipe box just before the ingredients. So this recipe has 8 servings at 189 calories per serving, or 1512 calories for the entire dish. Cheers. I had to make some adjustments because I didn’t have a jalapeno and my oven is in need of replacement. I did a can of tomato sauce and 1 Tbsp chili powder instead and it was very mild, which works for my family. I think this would be very easy to turn into an instant pot recipe and I’ll try that next time. I was steaming veggies for baby food so my IP was busy. 😉 I plan to saute the meat, add the water next, then add the rest of the ingredients as stated above and depending on the size of the taters, do high pressure for about 8-10 mins. Great recipe. I made mine with vegetarian burger. I have also used lentils instead of burger to make it. It made very tasty tostadas as well. Love your blog Patrick, I have spent parts of 5 winters now in Mexico. We prefer to cook for ourselves most of the time although we have been to many excellent restaurants as well. Thanks Rene! Glad you are finding some keeper recipes on the site. Cheers. I made this recipe for my Mexican boyfriend (he was craving it) and he said it was one of the best he’d ever had! 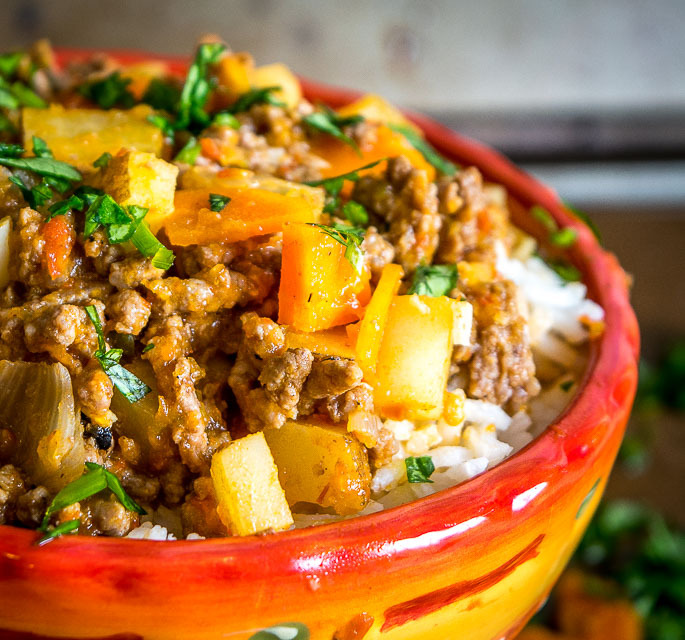 I personally don’t like picadillo but this recipe completely changed my mind! It was amazing and I’m gonna make a double batch next time so we have lots of leftovers 🙂 Thanks for posting! Thanks Sydney! 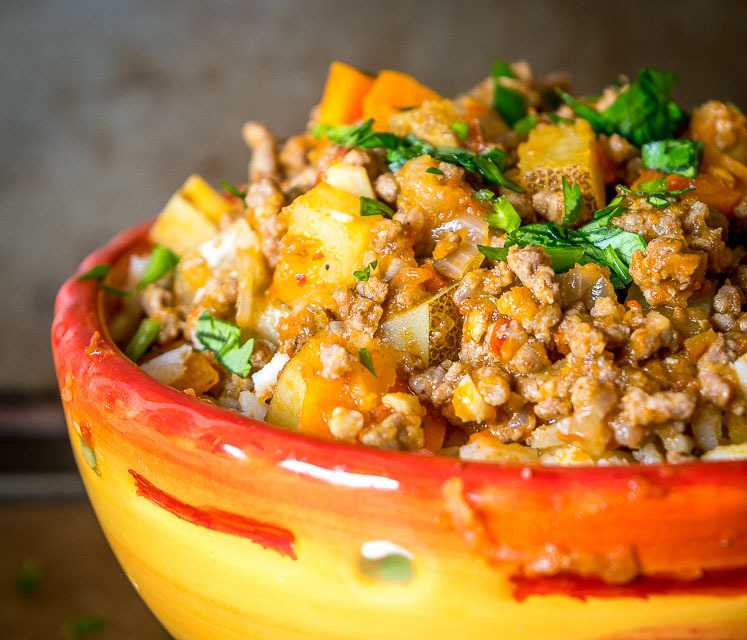 So glad it was a hit for you guys — leftover Picadillo in the fridge is a real treat, so easy to heat up for a quick meal! This was so good. I didn’t have enough Roma tomatoes so I substituted with a can of Roasted tomatoes with Chili. I also added 1/2 beef bouillion,1/2 tsp of liquid amino, and 1/4 cup of beef broth if it was too dry. It was sooo good. We ate it all week. Lacked a distinct flavor despite the spices? jalapeno and chili. Liked the lime rice as a twist.